Polyphosphazenes, an emerging class of polymers, include macromolecules, which have been proven to be biocompatible, biodegradable, and bioactive. Their unprecedented structural diversity and unique properties make them suitable as vaccine adjuvants, microencapsulating agents, biodegradable materials, scaffolds for tissue engineering, biocompatible coatings, and carriers for gene delivery. Polyphosphazenes for Biomedical Applications offers a thorough review of polyphosphazene research findings in the life sciences, chemistry, and chemical engineering. It emphasizes biomedical applications as well as recent advances in polyphosphazene development such as high-throughput discovery and the latest controlled methods of synthesis. The book brings together, analyzes, and contextualizes a wealth of knowledge that previously could only be found scattered throughout the scientific literature. All the chapters have been written by leading researchers in the field. 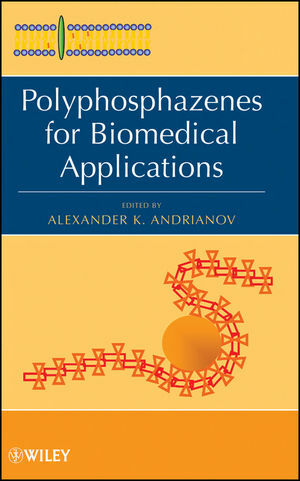 Editor Alexander Andrianov, who has led the effort to commercialize polyphosphazenes for biomedical applications, has carefully reviewed and edited all chapters to ensure readability, accuracy, and thoroughness. Polyphosphazenes for Biomedical Applications is not only intended for researchers working in polyphosphazene chemistry, but also for all researchers seeking solutions to problems arising in the areas of biomaterials, drug delivery systems, and controlled release formulations. Alexander K. Andrianov, PhD, is a Vice President of Research and Development at Apogee Technology, Inc. Dr. Andrianov has more than 25 years of experience in the discovery and development of novel polymers for biological applications, including biodegradable materials, vaccine adjuvants, macromolecules for microencapsulation, controlled release formulations, and transdermal drug delivery systems. He is an author of over 60 research manuscripts, review articles, and book chapters and an inventor with 41 issued and pending patents. Dr. Andrianov has been involved in all aspects of technology development and commercialization. 1 Polymers for Biology and Medicine - Current Status and Future Prospects (Alexander K. Andrianov and Robert Langer). 2 Expanding Options in Polyphosphazene Biomedical Research (Harry R. Allcock). II VACCINE DELIVERY AND IMMUNOMODULATION. 3 Polyphosphazenes as Vaccine Delivery Systems (Alexander K. Andrianov). 4 The Potential of Polyphosphazenes in Modulating Vaccine-Induced Immune Responses I: Investigations In Mice (George Mutwiri, Ponn Benjamin, Alexander K. Andrianov, and Lorne Babiuk). 5 The Potential of Polyphosphazenes in Modulating Vaccine-Induced Immune Responses II: Investigations In Large Animals (George Mutwiri and Lorne Babiuk). 6 Polyphosphazenes as Adjuvants for Inactivated and Subunit Rotavirus Vaccines in Adult and Infant Mice (Kari Johansen, Jorma Hinkula, Claudia Istrate, Elin Johansson, Didier Poncet, and Lennart Svensson). 7 Polyphosphazene Immunoadjuvants for Intradermal Vaccine Delivery (Alexander K. Andrianov, Daniel P. DeCollibus, Helice A. Gillis, Henry H. Kha, Alexander Marin). 8 Biodegradable Polyphosphazene Scaffolds for Tissue Engineering (Syam P. Nukavarapu, Sangamesh G. Kumbar, Harry R. Allcock and Cato T. Laurencin). 9 Biodegradable Polyphosphazene Blends for Biomedical Applications (Meng Deng, Lakshmi S. Nair, Nicholas R. Krogman, Harry R. Allcock, Cato T. Laurencin). 10 Polyphosphazenes from Condensation Polymerization (Patty Wisian-Neilson). 11 Electrospun Polyphosphazene Nanofibers For In Vitro Osteoblast Culture (Maria Teresa Conconi, Paolo Carampin, Silvano Lora, Claudio Grandi, Pier Paolo Parnigotto). 12 Phosphazenes and Surfaces (Mario Gleria, Roberto Milani, Roberta Bertani, Angelo Boscolo Boscoletto, and Roger De Jaeger). 13 Amphiphilic Ionizable Polyphosphazenes for the Preparation of pH-Responsive Liposomes (David Ghattas and Jean-Christophe Leroux). 14 Poly- and Cyclophosphazenes as Drug Carriers for Anticancer Therapy (Youn Soo Sohn and Yong Joo Jun). 15 Amphiphilic Polyphosphazenes as Drug Carriers (Liyan Qiu and Cheng Zheng). 16 Synthesis and Characterization of Organometallic Derivatives of Polyphosphazenes and their Applications in Nanoscience (Carlos Diaz and M. L. Valenzuela). 17 Transport Properties of Polyphosphazenes (Joel R. Fried). 18 Potentiometric Monitoring Antibody-Antigen Interactions by and Stabilization of Polyanilineand Electrodes with p-Sulfonated Poly(bisphenoxyphosphazene) (Byeongyeol Kim, Alexander K. Andrianov, Alok Prabhu, Vladimir Sergeyev, and Kalle Levon). VI WELL-DEFINED POLYPHOSPHAZENES: SYNTHETIC ASPECTS AND NOVEL MOLECULAR ARCHITECTURES. 19 Synthesis and chemical regularity in phosphazene copolymers (Gabino A. Carriedo).